The U.S Army will seek to avoid sensitive areas and pursue alternative helicopter landing zones based on the 2,350 individual and organizational comments they received. Last summer, we shared the US Army’s proposal for several helicopter landing sites in the North Cascades for pilots to practice flyovers and high altitude landings. Some of the proposed landing zones have raised concerns because of their proximity to popular recreation lands, trails, and designated Wilderness areas. We understand and appreciate the need for our military to provide the quality training necessary to defend our country. We strongly feel we can support military readiness through appropriate training exercises, while also honoring the decades of work that the American public, the U.S. Congress, federal agencies, and local residents have made for conservation and recreation in the North Cascades. We shared information on how to comment on the proposal, and things to consider in terms of the wilderness character of areas impacted. Thank you to those of you who took the time to comment! Earlier this month, the U.S. Army joint-based Lewis McChord issued a press release explaining that they are going back to the drawing board on their army helicopter training proposal based on the 2,350 individual and organizational comments they received in response to their proposal last summer. They are scrapping the original helicopter landing zones (including those located within the Alpine Lakes Wilderness and directly on top of existing USFS trails in the Wenatchee-Okanogan National Forest) and are working to identify alternative sites. No date has been announced for a revised environmental assessment. We appreciate the military's willingness to listen to concerns about the impact the proposed landing sites would have had on Wilderness areas and experiences. The Army has clearly taken the concerns raised by our community last fall seriously. Thanks to each of you who played a part in advocating for the conservation, recreation, and wildlife protections in the North Cascades and southwest Washington. 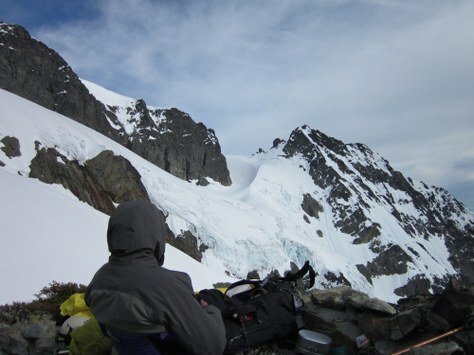 As an organization, The Mountaineers weighed in on this issue through two comment letters, with WA Outdoor Alliance and one with 65 other conservation and recreation organizations lead by our partners at Washington Wild. Thanks for screwing over our servicemen and women. For this reason alone, you will never get a dime from me and my household. Here's hoping you never are injured and need a helo extraction. I was disappointed to read your comment and disagree with your sentiment. As a former Army Infantry Captain (West Point graduate, Airborne and Ranger-qualified) and combat veteran from Operation Iraqi Freedom where I earned the Combat Infantryman's Badge and Bronze Star, I fully understand the need for our military to conduct realistic training. We had a saying: "Train Like You Fight." My understanding of the situation is that JBLM needs a nearby training site to approximate helicopter landing dynamics at high-altitude. While I wholeheartedly agree that they do need to find a suitable training site, I do not believe it is necessary to degrade the wilderness experience people seek when they visit the areas in the Army's proposal. My wife and I moved to Seattle specifically to have access to our nearby mountains and, thankfully, through the amazing climbing courses offered by The Mountaineers, have been able to start scratching the surface of the endless scrambling, climbing, and skiing possibilities right in our backyard. After being elected as the Board President of The Mountaineers, I pushed for the development of our Youth programs to expose the next generation to the benefits of being in the wild: self-reliance, self-reflection, and a desire to protect our wild places. We took our daughter camping at the age of 2 months near one of the proposed landing sites in Leavenworth. I wouldn't have wanted that peaceful experience to have been interrupted with the sounds of rotor blades. The Army may not have realized how special these places are to our outdoor community when they made their proposal and I applaud them for seeking a "win-win" situation: finding other sites which meet their training needs but that keep our wild places wild.